Larry Dean Stewart 1948 – 2007 was the creator and original Secret Santa. Through his personal example over a twenty year period, he demonstrated and defined the role and mission of Secret Santa. "Secret Santa's" random acts of kindness over the years had an impact on people throughout the world who either were beneficiaries or who read in media reports his random acts of kindness and giving; especially three months before his death in January 2007 when his personal identity was made public. The Society of Secret Santas builds upon the legacy of Larry Dean Stewart. We invite you to read and learn of this remarkable man, the legacy he left behind and the foundation he built for the future. 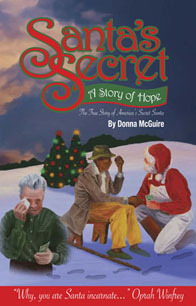 Santa's Secret -- A Strory of Hope can be found at Salvation Army Thrift Stores in Kansas City MO. Today, Larry Dean Stewart's loyal ELFs and the Secret Santas he trained are building upon the foundation he laid. Secret Santa's and ELFs are very busy every Christmas. From coast to coast in selected cities and towns they spread hope each Christmas, giving one hundred dollar bills to the needy. In 2007 in honor of Larry Stewart each one hundred dollar bill bore the name Larry Stewart Secret Santa.